Michael Moss’ 2013 bestseller Salt Sugar Fat presented an eye-opening account of food makers’ quest to create “craveability” in their products. Its central conceit: How food manufacturers keep the public coming back despite the cumulative toll bad diets take on our health. It’s an important and rewarding read that goes beyond the what’s-in-your-food trope and seeks to uncover how pantry staples have become so successful. Mission statement aside, the book is also filled with loads of tantalizing shoptalk from previously anonymous food scientists, gushing about their roles in inventing some of the most iconic brands in American history. 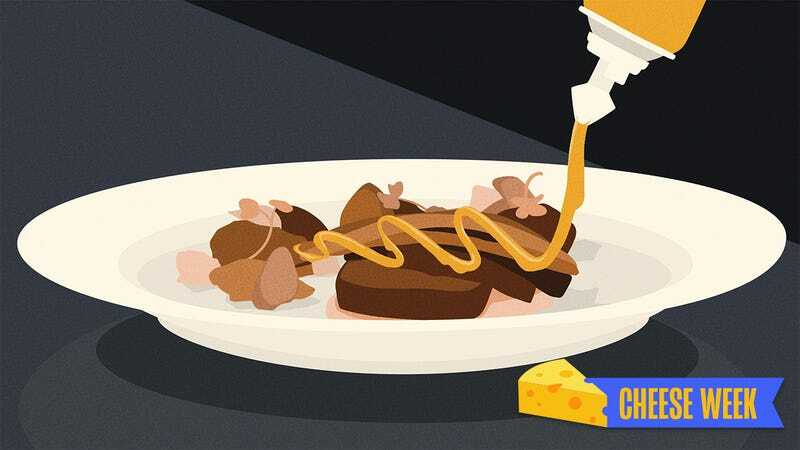 Southworth told Moss that a parsing of Cheez Whiz’s listed ingredients revealed that the snack no longer contains any actual cheese, an essential element when he worked at Kraft. When Moss tried to confirm Southworth’s hunch with the company, a spokesperson told him some amount of cheese is still included, just not as much as before, and no, she could not specify how much less. Fortunately, a professional degree in the hard sciences is not a requirement for making Cheez Whiz at home. For those who are surely exclaiming: “Why not save time and buy the jarred stuff?”, I counter that a serviceable alternative can be whipped up in home kitchens at a cost comparable to the store version—and in only a few minutes. Granted, DIY Cheez Whiz will never be a “whole food” in the Paltrowvian sense. The spread was originally conceptualized as an alternative to Welsh rarebit, a tartine smothered in an elaborate cheese sauce. When Cheez Whiz was introduced in 1952, first in the U.K. and then the U.S., the heat-and-eat convenience was the heart of its appeal. But don’t let that detract from recapturing the magic of the original formula. Bring the evaporated milk to simmer at medium-low heat on a stove top. Combine cream cheese, shredded cheese, and seasonings in a blender. Pulse for about 30 seconds. No blender? No problem! All the ingredients can be mixed by hand in a bowl, or even in the saucepan used to warm the evaporated milk. The end result is less emulsified, but essentially the same. What if you want to abandon all restraint, go full mad scientist and try to create the sprayable version that comes from an aerosol can? Well, begin by noting that the stuff in the can is called Easy Cheese and is a different product altogether. Then have at it. Get yourself a spray dispenser that uses nitrogen dioxide or carbon dioxide gas canisters to aerate liquids and convert them into fluffy foams. This process is different from actual Easy Cheese, which stores the gas in a compartment separated from the foodstuff, but it’s as close as you’re likely to get this side of the hardware store. Fill the dispenser with the cheese sauce while still warm. Close the canister, pressurize, and shake every few minutes. Wait for the mixture to cool, but only slightly. Spraying the cheese while it’s too hot results in formless cheese blobs. Cooling it to room temperature or below has the same effect, with the added risk of congealed cheese becoming too solid to spray out at all. Twenty minutes after filling the dispenser with hot cheese seems to be the sweet spot. The cheese has cooled down enough to hold its shape after being sprayed, but is still warm enough to maintain a low viscosity. Enjoy guilt-free knowing you’ve bested both food conglomerates and science.